As procurement and supply chain professionals in 2015, we’re seeing something develop that was long overdue for our industry. We’re seeing companies starting to understand the value of the procurement, and more importantly the strategic sourcing and supplier relationship management roles within their organizations. As such, in almost every single industry; we’re seeing a HUGE demand for talented strategic sourcing professionals. Businesses of all types and all sizes are starting to understand that strategic sourcing professionals can have as much, or more, of an impact to the bottom line than even their top sales people can bring. Businesses are starting to get that supply chain has risk, and the right professionals can mitigate risks (which minimizes profit loss). Those same professionals can ensure a fair price for a good product or service, and ultimately can drive meaningful savings to the bottom line. Aligning with the right suppliers can also help increase efficiency, and in some cases, launch new products; which both help the bottom line. A lot of global manufacturers have known this forever, but now mid-market and smaller companies are getting on-board the procurement band-wagon; and it’s every industry trying to improve their procurement and sourcing talent. Okay, arguably the Government isn’t doing much in this regard (even if they like to pretend they are); they really need a ground-up overhaul. So procurement is important. Management is starting to understand why the word “strategic” is attached to strategic sourcing. The sacred cows of Marketing, IT, Engineering, and HR are actually now asking sourcing groups for help. Yet, one thing I hear from Strategic Sourcing managers almost universally; “I don’t have the resources to support them”. These sourcing groups are being tasked with getting involved in strategic decisions for the business, yet they don’t have the people to get it done. Worse, when they put in the request for a sourcing professional the HR department comes back with a salary range that is in alignment with a classical “purchasing” function. They are assigning tactical salaries to strategic positions. To make it worse, the industry is hot, and the more progressive companies are out their poaching the talent from smaller and mid-market companies left and right. Let’s face it, if you are a talented sourcing professional, in this market, you can write your meal-ticket to just about anywhere. Progressive companies understand that a moderately high salary is easily offset by the results a good sourcing professional will bring to the table. But, I continue to see job postings, and field “sourcing contractor” requests from companies that have ridiculously antiquated salary expectations. I saw one today (which spurred this post), from a decent size company, that wanted someone that is bilingual, with 15 years of sourcing experience in engineered products, legal, travel and marketing; in the Philadelphia market (a very hot market) that would work on a 1099 contract position for 1 year at the whopping upper limit of $35.00/hr. Note, this is a 1099 position without benefits or paid time off. So assuming the person works the full year, they’d be lucky to net around $45K per year after the expenses associated with being self-employed kick in. Wake up Management and HR. The “strategic” sourcing positions that need to be filled in your company are not good fits for tactical people. And tactical people will be the only ones replying to your requests for contractors and full-time positions when you are only paying tactical salaries. Most companies wouldn’t hesitate to pay a premium for a top sales person. That’s why commissions work. You don’t really care if you have to pay a salesperson $20K more if they bring in another $200K of profit. So why will you not pay a sourcing professional $20K more to save $200K annually? 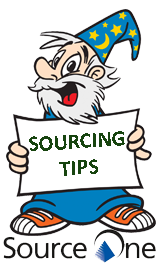 Good sourcing professionals can do that, and so much more. This is right on the money given the trends associated with Strategic Sourcing, value add and rising salary levels for the profession.